Apologies for the lack of posts, I've been on holiday the last 2 weeks to South Africa; which was amazing as it was their Summer so the weather was beautiful. I'll post some pictures as soon as I've transferred to my laptop, but in the meantime you can check my instagram: frootibeauty. 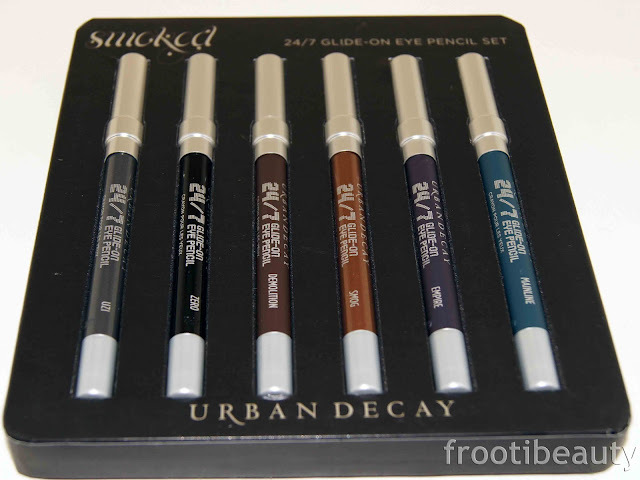 I've been meaning to review a couple new Urban Decay products so I thought I'd start with the Smoked 24/7 eye pencils and the Ocho Loco set that came out this Fall. I bought the Ocho Loco set last month as I was excited seeing them in store, particularly the new colours Psychedelic Sister (a real purple shimmer as opposed to violet purples), LSD (midnight blue shimmer) and Junkie (teal shimmer). The set consists of 8 full size eye pencils, some available to buy singularly and others only in this set or other LE sets. The sets are usually great value for money and this one is no exception; I bought the set from Debenhams for £36 in their 10% cosmetics sale (usual price £40), which meant that each pencil only costs £5 if you buy it at the full price of £40, which means you're saving £8 per pencil as they're sold at £13 each. All in all this set is worth £111 (including the Grindhouse sharpener) but you only pay £40 so you save £71 (or more if you buy it in the sale like I did!). 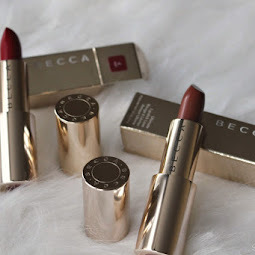 The set can apparently only be bought online at Debenhams and House of Fraser, but sometimes they are available in certain stores so it's best to check your local store if you can't find it online. The smoked pencil set consists of 6 trial sized pencils and is particularly exciting for those who love smokey eyes, as you have 3 matte pencils (Zero, Demolition & Mainline) and 3 with slight shimmer (Uzi, Smog & Empire). 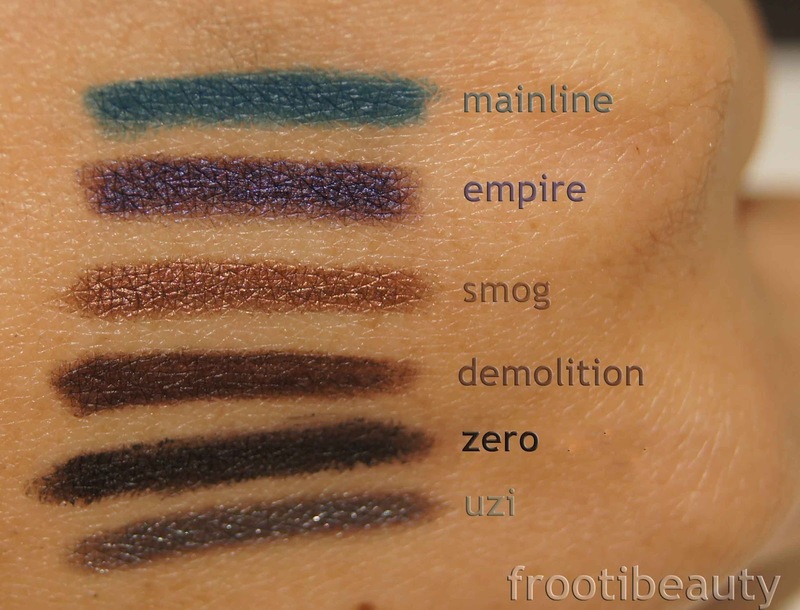 Mainline (gorgeous peacock teal) and Empire (eggplant purple) are two new shades I haven't seen before and are definitely my favourites; Uzi was in the 15 year anniversary pencil set (read about the set here) and Smog is another colour that was brought back by demand. The set is sold at £26 a pop which equates to around £4.33 per pencil; still not bad value for money particularly if you're a fan of their pencils as much as I am. FrootiFactor: I have to say I love all Urban Decay 24/7 eye pencils so I'd give a biased FrootiFactor of 4.5 for this one as my only qualm is the sizes of limited edition pencils! The set is available at selected Debenhams and House of Fraser stores as well as online and in these online retailers: HQ hair, Look Fantastic, and Beauty Bay. 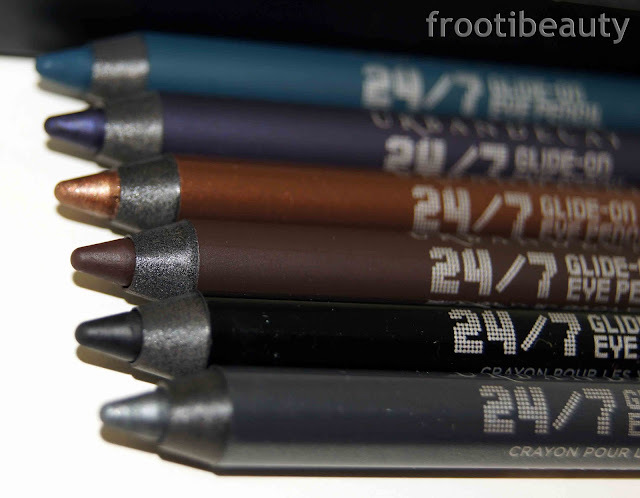 Have you tried Urban Decay's 24/7 eye pencils before? Will you be buying any of these sets? 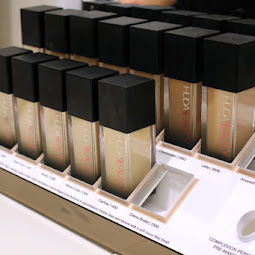 Two weeks ago I got to get up close and personal with Pixi products at their London store in Fouberts Place and talked about the new AW12 releases. Pixi is a brand I've always been undecided on; I love their name and quirky vintage-feeling shop. 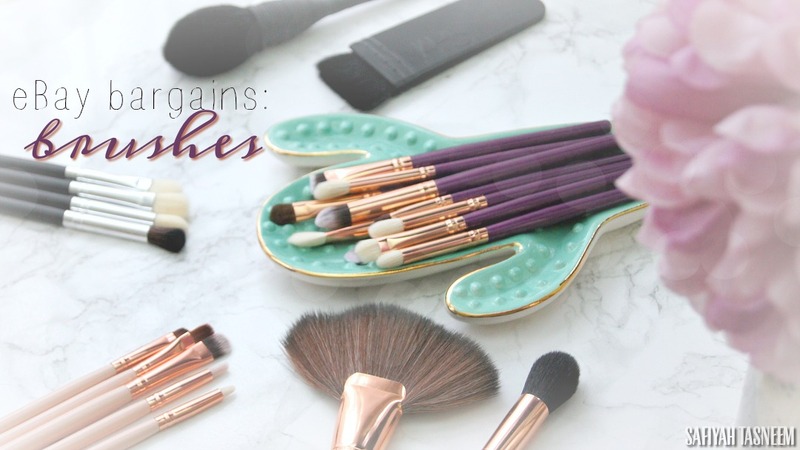 I used to buy their lip blushes when they were available in Debenhams and a few of their brushes too which I quite liked; but I've never been able to try eyeshadows/blushes or other lip products so it was a great opportunity to do so. The shop was filled with a lovely warm smell and I was offered some yummy pastries as I entered. I got to take away the Early Bird Kit which consists of 3 cheek colours, 2 bronzers and a highlighter, 4 eye base shades and 16 eyeshadows. The kit is designed to make you look like you've got more sleep than you actually have with it's "daylight colours". 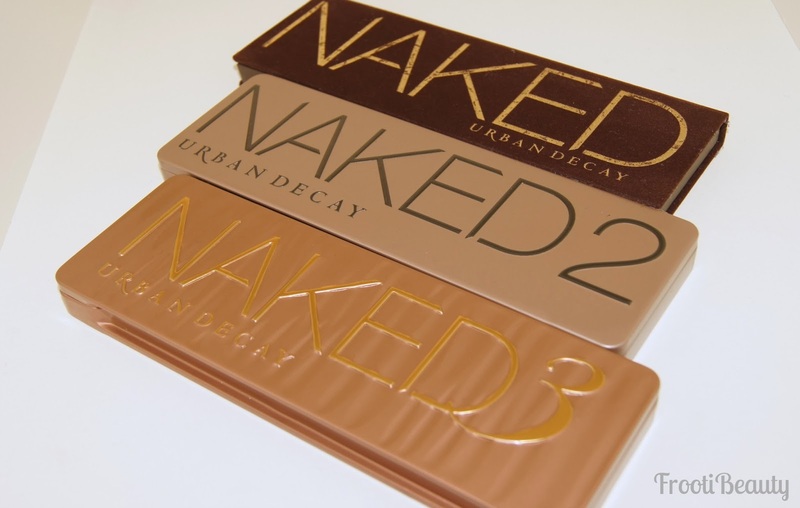 I've not yet come across base shades that are powders/eyeshadow-like like these but I've used them underneath some shadows to see the effect and it does seem to make the shadow more vibrant. Overall I found the palette to be quite soft and pigmented; the blushes were lovely, not too over powering. The highlighter and bronzers I feel are more suited to fairer skintones so I'll have to find a way of using them all as highlighters. The eyeshadows were hit and miss; some were soft and creamy in texture and others grainy. They're mainly lovely light colours with the odd darker colour and one matte shade too, so many looks could be created. I'd give this palette a 3.5 out of 5 because it's improved my expectation of Pixi but this particular palette doesn't have face shades that would suit a range of skintones. It consists of a double ended lipliner and lipstick in the same shade which is so handy as a MUA but also as a lippie buyer! The lipliner is waterproof and anti-feathering, whilst the lipstick is moisturising with Vitamins E and C. I chose this shade as it's rare to get lighter shades like this in matching tones, however as my lips are fairly dark, this colour is too pale for me so I'll be using this in my kit for fairer clients. I did notice that the lipliner coupled with the lipstick felt nice and moisturising but also lasted a long time too, so these are definitely plus points. 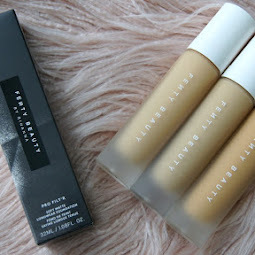 I'd give this product a 4.5 out of 5 as it's hydrating but also long lasting; I like that you don't need to waste time faffing around looking for a lipliner or that it would take up much space, as it's a handy two in one! All Pixi products can be bought from their boutique off Carnaby Street (22a Fouberts Place) in London, pixibeauty.co.uk, or ASOS. 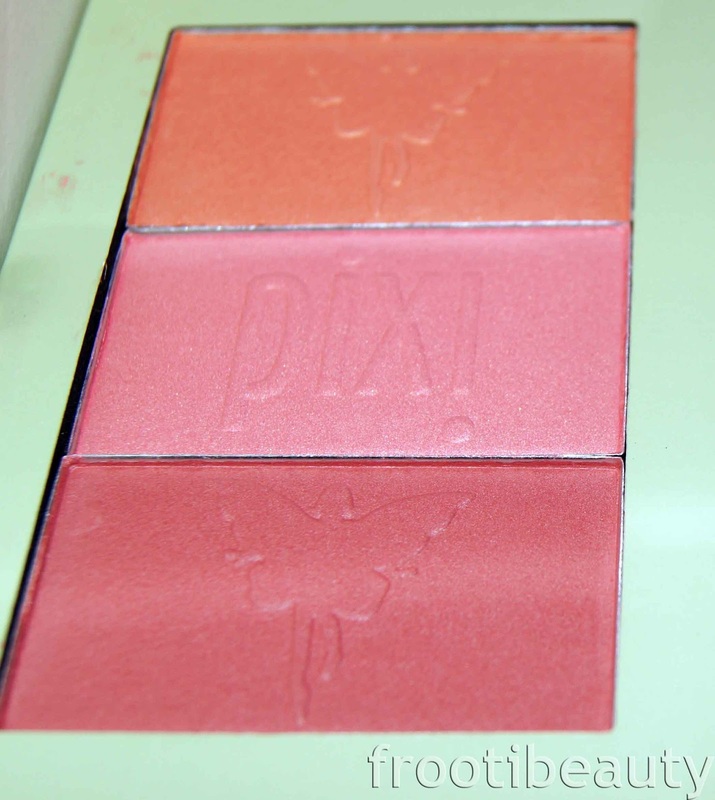 Have you tried any Pixi products before? Which would you recommend?